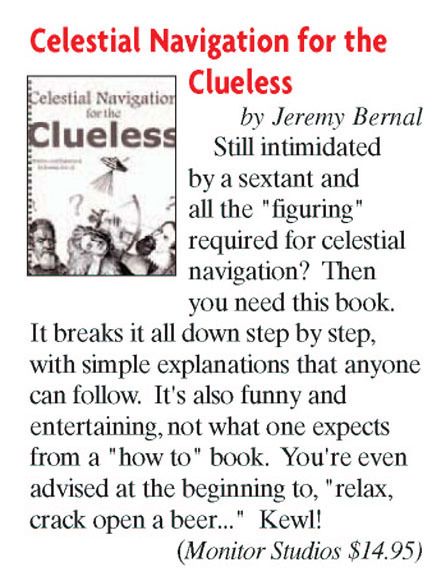 "Celestial Navigation for the Clueless"
During my search for knowledge about how Celestial Navigation works, I ran through hundreds of dollars of worthless books that did nothing but frustrate me. So, in order to help myself out, I started writing a book for myself as I learned, fixing the learning problems along the way as I advanced, and ironing out wrinkles in other books' teaching methods. I even went so far as to rebuild standard sight worksheets into a format that actually makes sense, in addition to making new ones for use with the Nautical Almanac's compact SR Tables-- no need for cumbersome volumes of HO229 or 249 books! The full book is 110 pages, is packed full of step-by-step examples, color 3-D illustrations, etc. and is available in Adobe PDF format. It contains full information and tutorials on how to do Polaris sights, Noon sights, Sun, Moon, and Star sights, Sight Reductions, and how to plot Lines of Position. It contains worksheets and all the pertinent almanac pages that the tutorials are based from. 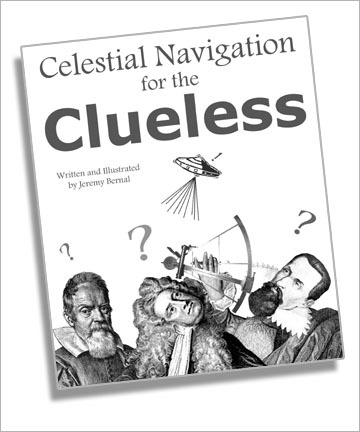 There is absolutely nothing more you will need, other than a sextant and an up-to-date Nautical Almanac, to learn and practice Celestial Navigation. Since I have no space to store books on the boat, I've decided to publish the book both digitally and on-demand. A sample covering everything up to Longitude by Noon Sight is available for free; the whole book is available digitally for a mere $10, or through Amazon.com! I've put the first 33 pages in this free file so that you can get an idea of what the book is like-- writing and learning style, etc. Now available on Amazon.com! Click here to order. You will receive an email from me (might take a few days if I am out sailing) which contains the password to open the file. And, of course, reader input is always appreciated! If there are spots that confuse you, please email me and let me know what it was and why, so I can fix it in future revisions.